Unusual thought it may be for me to have eaten at three different Thai restaurants within a four day span, I did. Each time was with a different person and coincidentally we ended up ordering Thai Beef Salad each time. This was not a problem for me because Yum Nua is one of my favorite Thai dishes. Having said all this, each salad was both similar to and different from the other ones. The first Yum Nua that I had was in the Conejo Valley at my favorite local Thai Restaurant. That being said, there really is no other local Thai Restaurant as this company has at least four locations in the Conjeo as well as one in Camarillo and one in Woodland Hills. 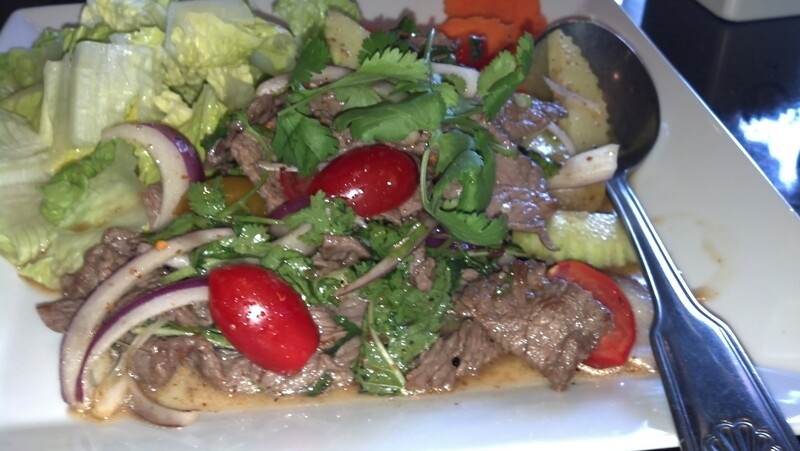 The salad is made with Lettuce, Tomatoes, Cucumbers, Red Onion and Beef Tenderloin with a dressing that definitely has Fish Sauce in it although in their version the Fish Sauce taste is not prominent. Oh, by the way it is also listed as Spicy – I get mine medium and it is quite tolerable (and this is for someone who cannot take it really hot!) I always order it with a side of steamed Jasmine Rice just in case the heat is more than I can stand. This particular evening I had dinner with two former students of mine so we also ordered Tom Yum Soup and Yellow Curry Chicken. Everything this evening was quite good and tasty! The second Yum Nua I had was actually the next day when I went to visit my family in Lompoc. My daughter-in-law and I were out shopping and decided to stop for lunch. There are actually at least four Thai Restaurants in Lompoc but the one that we went to was the one that Nereida thought was the best one. In comparing the dishes and the prices to the one in the Conjeo, I would say that the portions were actually larger for the same price and the Beef Salad was more Beef than Salad which I suppose would be good for most people. We ordered the Salad medium which was the same that we had ordered the night before. When it came to the table and we both tasted it, we actually had to send it back because it was intolerably spicy – I think even in Thailand it would have been too spicy for most people. When something burns the lining of your stomach after one bite, you know that it is way too hot. I think they just went overboard with the Chilies! All that being said, we also ordered Pad See Ewe which was flat noodles with Chicken and Fried Tofu. I am sorry to say that I definitely did not like this dish either – there really wasn’t much flavor and the noodles were sort of on the mushy side. For an appetizer we ordered the Pork Satay. The Pork was cut way too thick, and it was actually tough. The only good thing about this dish was the Peanut Sauce and the marinated Cucumber Salad that came with it. Again, the food at this Restaurant was about the same price as in the Conjeo but the portions were larger. However, I would rather have the smaller portions with better flavor and palatability! The third Yum Nua which I had was two days later in Moorpark at a Restaurant that I and my friend who I had lunch with had never frequented before, even though it was only one mile from her home. We ordered the Yum Nua, this time mild after my experience in Lompoc and along with that, Mee Krob which is a crispy noodle salad with Chicken and Shrimp. And of course, steamed Rice. The Salad was mild and we could have tolerated some more heat with it. The dressing was just a little on the fishy side (but as we ate it, that kind of disappeared). The beef with this salad was the most tender of all three and was cut into more palatable pieces. So the Moorpark Restaurant was the winner of the Yum Nua Salad and yes, I would go there and order it again! Now, the Moorpark Salad was good and the Conjeo Valley Salad was good, but the truly best Yum Nua that I have ever had was that one which I and my sons and daughter-in-law ordered and ate in Thailand! And this was in a restaurant! Now, you may wonder why I marvel at a Restaurant’s Yum Nua being so good! In Thailand, some of the best food is that which is prepared on the street! It is tasty and authentic and perfectly safe to eat as the vendors are very particular about cleanliness. One instance of comparing Street Food with Hotel Food as an example – we had a very good Tom Yum Soup from a floating boat vendor at the Floating Market – this cost us $1.50 per person. On one evening my daughter-in-law was hungry and we were at the hotel so we went down to the hotel restaurant. She ordered the Soup which at the hotel cost $10.00 and wasn’t nearly as good! So, when in Thailand, do try the food from the street vendors or at the very least, the small restaurants! 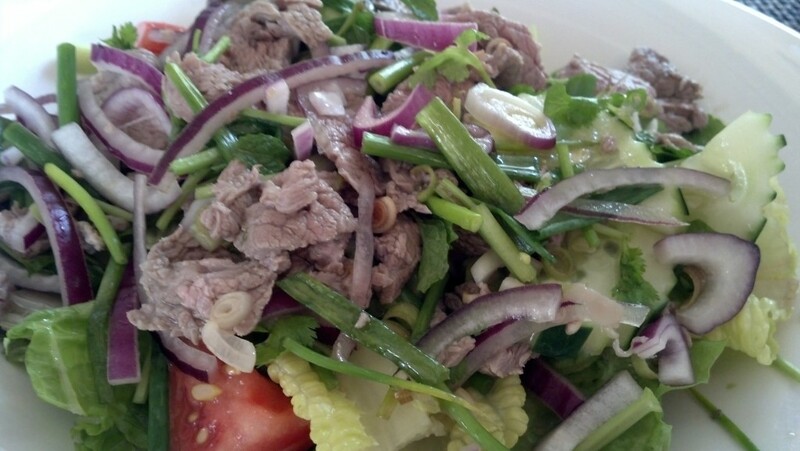 The second best Thai Beef Salad that I have ever had was at the Maui Thai Restaurant in Kihei. Sorry, no photos for Moorpark or Lompoc. Next time I frequent the Moorpark Restaurant, will take photo, but sorry, not at the Lompoc Restaurant – at least not the one we went to on Saturday.